We create either for fun or "under the gun". Be willing to discard the "old" paradigms that have served you long and well, with which you are both familiar and comfortable. This is the "box" in which you must not be trapped if you are to make progress. Ford Motor Company has been leading the automotive industry in design innovation for more than 100 years. In their basic corporate value statement, Ford Motor Company writes, "Our business is driven by our consumer focus, creativity, resourcefulness, and entrepreneurial spirit." "Creativity is a continuous activity for the entrepreneur, always seeing new ways of doing things with little concern for how difficult they might be or whether the resources are available. 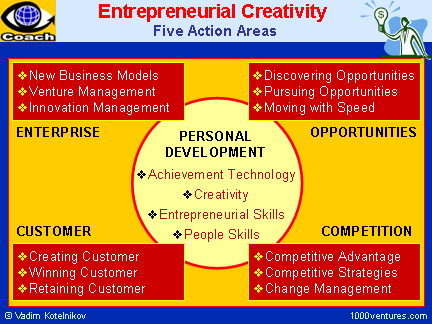 But the creativity in the entrepreneur is combined with the ability to innovate, to take the idea and make it work in practice. This seeing something through to the end and not being satisfied until all is accomplished is a central motivation for the entrepreneur. Indeed once the project is accomplished the entrepreneur seeks another 'mountain to climb' because for him or her creativity and innovation are habitual, something that he or she just has to keep on doing," says Bill Bolton, the author of The Entrepreneur in Focus: Achieve Your Potential. This is why entrepreneurs, disturb markets, 'thrive on chaos', and can challenge large established businesses. Searching questions can help you discover new opportunities, uncover the roots of a problem, and find creative solutions to it. Open your mind to what is possible. Asking searching questions starts with challenging assumptions. If you do not check assumptions you cannot be good at asking searching questions. Ask also your customer what they want and find common themes in response to your questioning. See contents Instant download! Buy now!